FamilyLife has developed Passport2Purity® to assist you in building heart-to-heart communication with your preteen while laying a foundation of purity that will prepare them for the turbulent years ahead. Through the shared listening experience, object lessons and guided conversations of a Passport2Purity weekend getaway, you can set your son or daughter on a journey of moral integrity—and strengthen the bond between you. Learn about the Passport2Purity Project Kit (available separately here). While over 250,000 young people have gone through Passport2Purity® with their moms and dads over the past 15 years, it has been completely revised to stay current and address the new challenges that today's young people are facing. The third edition of Passport2Purity (Version 3) features new design, completely updated content, and the addition of 25 student devotionals. 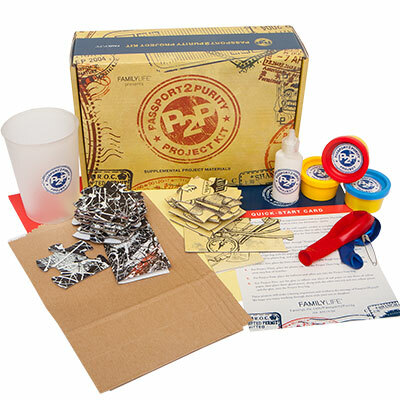 Also available is the Passport2Purity® Project Kit which features materials needed to do the weekend projects; and the Passport2Purity Replacement Kit for parents wanting to take another child through the Passport2Purity experience (includes one Travel Journal and one visa sticker). Both are sold separately. Purchase the Passport2Purity Project Kit! Dennis and Barbara Rainey cofounded FamilyLife®, an international ministry to families and marriages, located in Little Rock, Arkansas. Dennis hosts FamilyLife Today®, a nationally syndicated broadcast bringing help and hope to nearly 1000 communities in the U.S. They have six adult children and a growing group of happy grandchildren.